During an early-May training session in Dubai, 24-year-old weightlifter Amna Al Haddad was attempting to hoist more than two-thirds of her body weight above her head when one of her elbows bent slightly, her knees buckled a bit, and the barbell slipped from her hands. The mass of steel came crashing down on her upper back before rolling off. Even for a competitive lifter, that kind of moment is frightening. Never mind seeing your athletic career flash before your eyes; a mistake in the weight room can negatively impact how you walk and talk for the rest of your life. For the 5-foot-2 Al Haddad, she escaped this slip-up with just a bruise. And yet taking those risks and overcoming that fear is part of what draws Al Haddad to weightlifting. A career journalist who quit her job to devote more time to her sport, Al Haddad is making a bid to represent the United Arab Emirates at the 2016 Summer Olympics in Rio, Brazil. What appeals to her most about weightlifting? Al Haddad cuts a unique figure in the weightlifting world. As a Muslim woman, she is one of a small but growing number of lifters who compete while wearing hijab, covering her arms and legs and donning a headscarf to cover her hair. 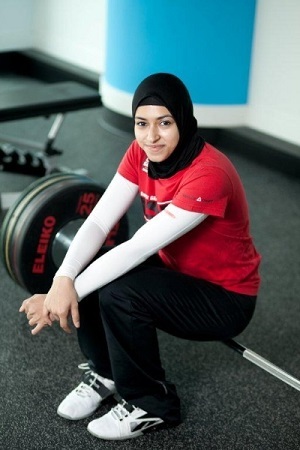 The International Weightlifting Federation’s 2011 decision to allow female competitors to cover their knees and elbows and wear headscarves opened the door for Muslim women in the sport, around the same time Al Haddad was making history of her own as the first woman from her country to compete in the Reebook Crossfit Games and the only Muslim woman to compete at the crossfit Asia Regionals in a headscarf. In 2012, she quit competitive crossfit and turned her attention to weightlifting. Less than a year later she was the first UAE representative at the Arnold Weightlifting Championships, the renowned competition named for bodybuilding legend Arnold Schwarzenegger. UMMAH SPORTS: What is your typical daily workout routine? AMNA AL HADDAD: I am currently managing most of my own training, with a support from an online program by Catalyst Athletics. My main focus on the current cycle is strength gain. I currently have seven sessions a week, where I alternate on doing strength work in the morning, and work on full lifts or their varieties in the afternoon, often working between 70 and 90 percent during the week, and doing heavy singles on Saturdays. A session lasts an average of two and a half to three hours, with total of about 16 to 20 hours a week, including two rest days. What was behind your decision to drop crossfit for a full-time focus on weightlifting? Couldn’t one have helped the other as far as enhancing your strength and athleticism? Two years ago my (weightlifting) technique was not up to par that would take me to the level I wanted, and as some say, changing techniques in weightlifting, especially starting at a late age, can be quite difficult. So I would say that I spent a big portion of 2013 just drilling technique to achieve high quality movement that is similar to elite weightlifters from a mechanical point of view. How did you first get into weightlifting? The story is two-fold. The first part of it, I was very unfit, unhealthy, dealing with severe depression and one day decided that I don’t want to lead that life anymore and wanted to take charge of my life. So I got into strength training, lifting weights — not the sport of weightlifting. The second part of it is that I got into crossfit in 2011 and did it for about a year, and was introduced to the Olympic Weightlifting movements which I found interesting and different. After competing at the Crossfit Asia Regionals, I realized that crossfit was not the sport for me to continue, but weightlifting became a passion and a focus. Did you have any doubt or hesitation about participating in weightlifting, since some people think it’s not for women and especially not for Muslim women? Not at all. My concerns for pursuing the sports were none of those related to gender or religion, but rather finding the right environment, coaching, and support toward my participation to represent the UAE in the sport internationally, as the sport is very young in the UAE. I have faced quite the challenges in the past two years since I pursued weightlifting full-time, as I quit my job as a journalist to train. I would say the tough part is not having a full-time coach or training facility that’s catered for serious weightlifters. Environment is everything, and for quite some time I have trained alone — but I had to keep training and going no matter what to be able to reach my goals. Have you personally received any negative feedback about your participation in the sport? Of course. It’s expected. I have received the typical comments of “belonging in the kitchen,” that I look like a “loser,” and many within those lines. What do you say to those people who think you shouldn’t be weightlifting? Well, I feel sorry for the way they feel and it’s a matter of spreading awareness and education regarding the sport. Each one of us has been put on earth to follow our own path, and what I am doing is following my passion and path. What about positive feedback? What do your fans say to you? It makes me happy to hear when I get emails and comments on people who say that I have inspired them to follow a healthy lifestyle. I have gotten emails from all over the world from people who shared with me their stories and many say that I am brave and courageous to do what I am doing, although I never saw it that way; it’s just me doing what feels right for me. I want to thank those who support me both locally and internationally. It means a lot to me to have people worldwide wishing to see me at the coming Olympics. Where in the world has weightlifting taken you? Before sports, I hated traveling! After my first travel for competition, I got addicted. I have been to Korea for crossfit. For weightlifting I’ve been to the USA, Austria, Belgium and Greece, and soon I am off to Germany. In a New York Times story from 2012 in which you were featured, it said there were 12 women training as competitive weightlifters in the UAE. To your knowledge, has that number gone up or down? According to recent reports in the local media, the UAE female team had stopped training for months since late last year due to lack of facility and funding. They recently resumed at the end of April, and I started to hold a couple of my sessions with them to do my training in order to compete with the team at an event this year, Inshallah. The team number has gone down to five. What misconceptions do the Muslim community need to have cleared up about female weightlifters, and female athletes in general? Sports is an honorable choice and it has nothing to do with religion or gender, but talent, hard work, humbleness, work ethic and more. Female weightlifters do not get “bulky” or look like a man as a result of weightlifting; that’s just a misconception. I think more credit can also be given to female athletes. I tend to feel the support toward female athletes is a lot less than those toward men, and women work just as hard, if not harder, than men sometimes to get better, perfect a skill, and our success is due to hard work and not luck. What are some of the dangers in weightlifting that a newcomer to the sport needs to be aware? Weightlifting is one of the sports with the lowest injury rates. One of the main mistakes people make when trying weightlifting is wanting to lift “more more more,” than actually focusing on having a solid base in terms of technique and strength. It’s a sport that requires a lot of patience and dedication, and not focusing on the right things could lead to an injury, especially those who don’t lift with the proper mechanics. How do you approach training during Ramadan? Does your routine change? What is your daily diet during the non-Ramadan months? My diet includes everything. I don’t cut any food group, I eat everything from dairy to veggies, to meat, fruits, rice, and potatoes. I happen to enjoy a burger every now and then and pancakes with maple syrup on rest days! To put simply, I eat for performance and to be able to withstand long sessions without a drop in energy, yet still watching my weight and body composition. I recently made changes to my diet after seeing performance consultant Keith Littlewood here in Dubai, who has helped me a lot in the past month. Who are some past and present athletes you look up to or draw inspiration from? I was truly inspired by Kulsoom Abdullah (the U.S. weightlifter who challenged the IWF’s rules prohibiting hijab). Her bravery created a true change in the universe, that has had an affect toward the sport of weightlifting. There are many athletes that I have met since I started this journey such as Pyrros Dimas and Valerios Leonidis and each one of them had an inspirational story to share and tell. Generally though, I’d like to draw inspiration within myself, and use myself as a reference point to where I have been, where I am, and where I want to reach — that’s what keeps me going. You said weightlifting helped you emerge from a battle with depression. How do you think participating in sports — or just working out — can help somebody today who might be dealing with depression? Putting aside the release of “feel-good” hormones such as serotonin post-workout, taking charge of your life and aspect of it gives you a sense of empowerment and being in control, even taking control of your depression. The beauty of sports and training truly goes beyond what you can do physically and how you can look physically, that’s just the external obvious benefits, but there are much deeper aspect to sports than just that; sports really shows your character and your attitude. It shows you who you are. How close are you to your goal of making the 2016 Olympics? Only time can tell! Frankly, I have dealt with many challenges that have left me with some worry and doubts in the past regarding reaching the level I require for the Olympics, but I have stayed focused. As a result, I am getting some support that’s helping me take things further and I am very grateful for those who currently support me from PurePharma, Aramex, RockTape, Magnet Media, Lanjaron mineral water, and a sponsor who offered to cover a couple of competitions. The round for qualifications start end of this year, and if I were to get all the support I need in the next two years — especially get the chance to train abroad and get the right level of coaching — I have no doubt in my mind that I will be representing the UAE on the Olympic stage in 2016 in Rio, Inshallah! In the meantime, I’ll keep doing what I am doing, working hard everyday, no matter what.